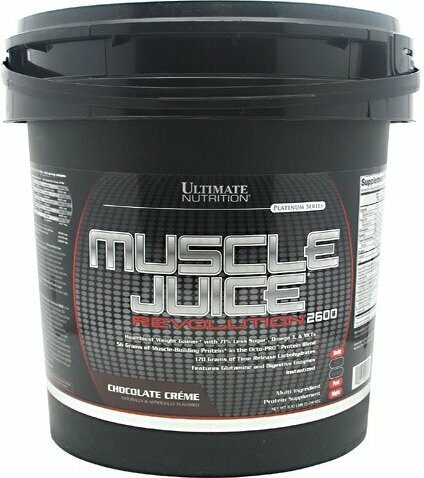 Mix four scoops of Ultimate Nutrition Muscle Juice Revolution 2600 (about 265 grams) with 18 fl oz (532 ml) of water or milk. To maximize muscle gains and enhance your exercise program, take one serving in the morning, and a second serving one hour after your training session. On non-training days, take one serving between meals in the morning and a second serving between meals in the afternoon. Due to the time release nature of Ultimate Nutrition Muscle Juice Revolution 2600, it is the perfect gainer to be taken right before bed. Imagine gaining weight every time you stepped on the scale. Pound after pound, you just keep gaining and gaining. Of course, with new muscle comes new strength and now you're curling the 70s and they feel so light! You're an eating machine and a beast in the gym - everyone knows you're on "something." You're on Muscle Juice Revolution 2600! Each serving is packed with 56 grams of high-quality protein, time released carbohydrates, EFAs and the breakthrough anticatabolic dipeptide L-alanyl-L-glutamine. This muscle-blasting combination is guaranteed to build slabs of mass on even the hardest of hard gainers! Experience the fastest weight gaining experience of your life with Muscle Juice Revolution 2600. That's why champs like Tony Breznik and Markus Ruhl take Muscle Juice Revolution 2600 three times a day when they're trying to add thick, dense muscle to their massive physiques. They know it works. Period. 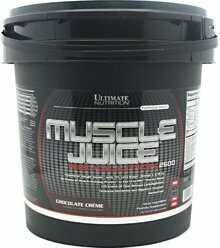 If you want to start making the fastest gains of your life, get on Muscle Juice Revolution 2600!